One of Scott Snyder’s greatest strengths as a writer, is his ability to make dread actually carry it’s weight. Whether this is your first comic, or you walked out of a superhero film there’s always a safety net to these stories. By in large we as readers know that our heroes will come alive, but Synder manages to make that safety net disappear. 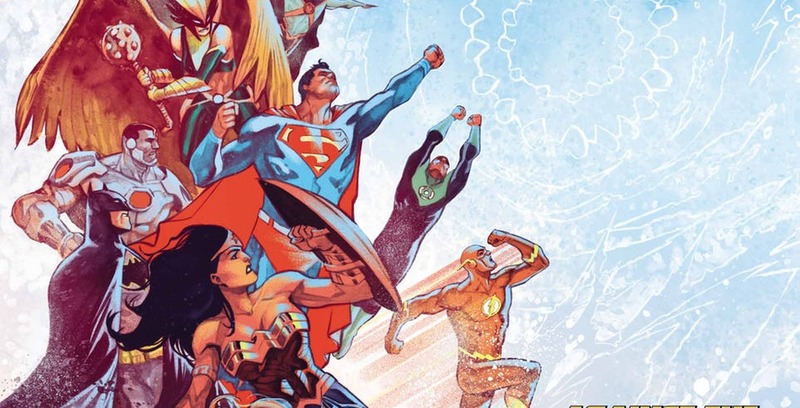 Having a vulnerable Superman and Flash (who’s transforming into a sea monster) race across the new oceans created by the Sea God, or Aquaman walk the plank into a cosmic whirlpool, all tense moments that grasp the readers by their jackets and never letting go. This seems like a basic skill that most writers should have, but only the great writers know how to make the dread feel tangible. This might be a repeat from my review of Drowned Earth Part 1, but I love how absurd this story is. So many comics today want to ground these legendary heroes in a realistic world with realistic consequences. There’s nothing wrong with that, I love those types of stories when they are done well, sadly they dominate the market. Drowned Earth (and Snyder’s run on Justice League as a whole) feels like a breath of fresh air. A reminder that these characters can have still feel grounded without sacrificing the fun that comes along with these stories. Just look at the pages featuring a crippled Batman carrying around Jarro (Starro in a jar), and Batman assuring Jarro that everything will be okay. The tensity doesn’t evaporate because Batman is carrying around a tiny star fish, if anything this scene provides a slight moment of relief as the sea comes crumbling into the Hall of Justice. It’s not impossible for stories to be weird and not have emotional value. What else can I say about Francis Manupaul that hasn’t been said before? In regards to the second chapter of Drowned Earth, this feels like a departure from Manupaul’s more traditional paint style, to a harder line work. That isn’t the case for every page, certain pages do featuring his older style but even with this slight change Manupaul’s art still remain astonishingly gorgeous. What may overshadow Manupaul’s line work is his colors. A plethora of colors are all over this comic, each serving their purpose to help set the mood in each given scene. From the bright deserts to the deep underground abyss, the coloring is integral to the storytelling. a amazing job by Manupaul one again. Drowned Earth continues to be a thrilling ride through the sea. A reminder that superhero comics should embrace the larger than life ideas, and don’t feel the need to be ashamed at what comics were, and how you can mold that for future comic readers.